RIP Rooftop Solar. 2009 – 2016. At current trends 2016 will be the last year in which new rooftop solar makes much of an impact on Australia’s carbon emissions. There is a widening gap between the rhetoric about solar and the performance of the rooftop solar industry, which is now in hospital with its vital signs not looking great. The inference is that because we have the highest penetration of solar rooftop globally we have a strong solar industry. But we don’t. Not anymore. In fact its dying. In 2009 the rooftop solar industry in Australia was born. In that year the number of small scale (less than 100kW) systems installed increased four fold from 14,000 in 2008 to nearly 63,000. In 2011 over 360,000 systems were installed! Over 10,000 Australian jobs had been created to service that demand. And in a growing and competitive market innovation flourished, giving Australia some of the lowest costs of installed solar globally. The installation of these solar systems made a substantial contribution to falling demand for centralised electricity generation. Centralised generation peaked in 2009, then began to fall. This had never happened before. By 2014 centralised generation in the National Electricity Market was down near 10% on 2009 levels. But in 2015 its very clear that Australia’s rooftop solar industry is in bad shape. 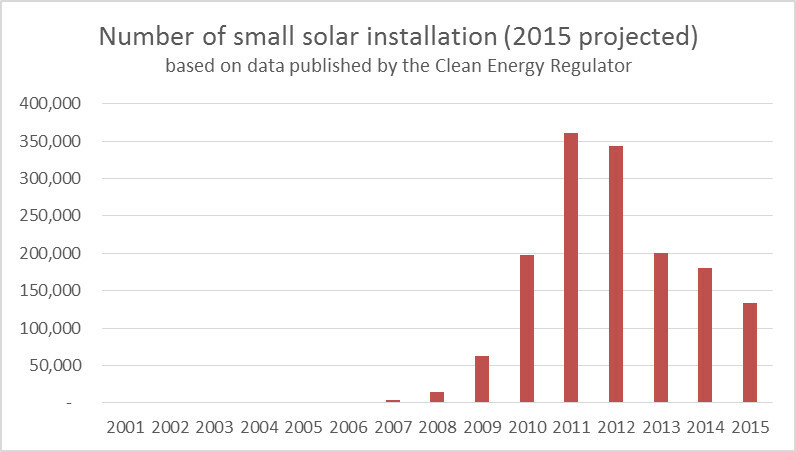 Based on installs for the first eleven months of the year, in 2015 around just 130,000 small scale systems will be installed in 2015 – around one third of the number of installs in 2011. In South Australia the number of systems installed in 2015 will be one-sixth of what was installed in 2011. If the trend continues, 2016 will see less than 100,000 systems go in across Australia. And in 2017 at current trend the numbers could potentially drop below that of 2009. RIP rooftop solar. Closure of manufacturing industries that employ thousands of Australian’s will usually warrant sustained national media coverage and government involvement. The Australian solar industry has seen thousands of solar installers and others quickly develop skills, but the loss of jobs in the sector has had next to no discussion. The consequences of the decline in the industry is both a loss of jobs, but also a great deal of under-employment. Small solar companies which once had perhaps 5 to 10 staff are down to 1 or 2, with their owners on the verge of calling it quits. Some solar installers scrape buy doing casual electrical contract work, many of them barely hanging on and waiting and hoping that the industry will take off again. Their careers were created by massive incentives, but are now fast disappearing as the incentives have vanished. It’s widely recognised that to decarbonise our energy supply massive investment is needed. The rooftop solar industry has attracted, for a time, the sort of investment required. In 2011 a rough estimate would be that Australian mums and dads poured nearly $2 billion of their own money into rooftop solar. In 2015 the amount invested will be one third of this. Rooftop solar has helped reduce Australia’s carbon emissions. But as the number of systems installed has plummeted, so has its impact on emissions. For the first time in six years centralised electricity generation this year will not be lower than last year. AEMO, the Australian Energy Market Operator, forecast centralised generation reverting back to its long term trend of going up each year. Why? Incentives and their management! Why has this happened? Why has an industry that represents the new clean green economy grown so quickly, but now is now on track to extinction? The core reason is incentives and their management. The industry grew very quickly on the back of huge incentives and with big price drops virtually lowering the costs of solar systems on a monthly basis. But the price drops have stopped, and feed in tariff’s – a key incentive – have continued to be cut. Consequently the payback on rooftop solar, typically now at 10 years or longer, is so long that it doesn’t make economic sense for rooftop owners. When prices dropped very quickly up to around 2013 it was very hard to get the incentives right. Policy makers found themselves having to make fast changes to keep budgets in check, as the price drops were hard to anticipate. But since 2013, with greater stability in pricing, it could be argued that the incentives have been reduced too quickly. The federal government incentive mechanism is the renewable energy target, which is used by solar installers to create an up-front discount based on the expected electricity production of the solar system over 15 years. When introduced in 2008 the mechanism had in place a five year plan to lower the subsidy, and then maintain it. This mechanism is now stable and future stability appears likely. State governments have incentivised solar through feed-in-tariff’s (FITs). Initially these were very high. They have been pared back to the point now that across most of Australia you pay three to four times as much for electricity that you consume than what you get for electricity you export. And in 2016 the payback on rooftop solar is likely to get worse, with utilities gradually restructuring tariffs to reduce consumption charges (which are offset by solar – so the lower the consumption charge the lower the savings from offset electricity use) and increase fixed charges, and with FITs also to further drop in 2016. In Victoria, for example, network charges (incorporated into the consumption charge) are expected to drop, saving the average household $100 to $150 a year from 2016. And its FIT will drop down to $0.05/kWh. The decline in network charges would not have been possible had not over 10% of Victorian households invested in solar, back when FITs were higher, reducing the need to invest in poles and wires. Ironically in continuing to reduce the FIT – making solar less attractive – the government is actually creating the conditions for the decline in network charges to be short-lived. Will batteries be the saviour? The solar industry itself is resting its hopes on batteries, the argument being that you don’t have to export electricity at very low rates, but that instead you can store that electricity and use it at night time, and thus get more financial benefit from your solar system. The hype around Tesla’s home battery system has, I believe, created false expectations as to the boost batteries will give the industry, with some expecting it to be the solar boom of 2009 to 2011 all over again. But the economics of batteries don’t stack up yet. A typical home’s electricity consumption charges may be around $1,000 to $1,500 a year. A solar system without batteries will reduce that by around $400 to $600 a year. A battery system worth $10,000 (price of an installed Tesla Powerwall) may save an additional $300 to $500 a year. It doesn’t really stack up for most households until the cost of the installed battery system is below $3,000, which appears to be quite some time away. And, unlike with the solar boom, no government, state or federal, is looking to introduce incentives to drive battery uptake. It can’t be assumed that batteries necessarily reduce carbon emissions. In fact installing batteries on an existing grid-connect system which was previously a net exporter of electricity and taking that home off grid can actually increase carbon emissions. Batteries may reduce network constraints and can enable a higher penetration of renewables, which will reduce carbon emissions, but where renewables penetration is relatively low (much of Australia) their inferred benefit in terms of carbon savings could be misrepresented. The more renewables you have in your electricity network the better the case for batteries, but in many parts of our network we aren’t there yet. This year Australia made a public commitment prior to COP21 in Paris to reduce its carbon emissions by 26% to 28% by 2030 compared with 2005– its “Intended Nationally Determined Contribution” (INDC). Electricity generation is our largest source of greenhouse gas emissions, and the reduction of emission from electricity generation will play an important role in reducing Australia’s emissions. Rooftop solar reduces the need for centralised generation, and, combined with centralised renewable generation (wind, solar farms) reduces emissions in the production of electricity. And we know it works. Yet so far governments, by and large, have failed to put forward concrete policy measures or to create a long term plan for decarbonising the electricity supply. And based on the current trend unless there is further policy support rooftop solar will only play an incidental role. Concern over high electricity prices. Concern that excessive solar penetration is bad for our electricity supply network, due to concerns around the intermittency of supply and its impact on network reliability. The belief that solar prices will continue to plummet. Unfortunately this reactionary response has some flaws in its reasoning. Various studies have shown that the growth in electricity prices over 2010-2013/14 was driven mostly by network price increases. Clean energy charges contributed to the increase, but were not the major reason. Yet what have governments done first when it comes to trying to reduce electricity prices? 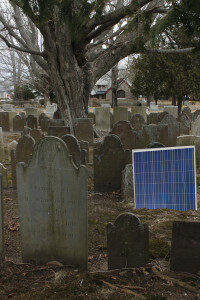 Slash solar FITs, not the main cause – network charges. Only in 2015 have network charges started to be addressed. And, whilst in a small number of network areas solar has caused network management challenges, this only represents a small portion of the overall network, places where solar penetration levels are generally well above the national average. Rather than recognise this as a challenge whose solution is needed worldwide and developing IP to solve it, most network companies have instead complained and argued for increased charges. Solar prices plummeted over the period 2009 to 2013. But that’s finished, and its very unlikely those sort of price drops will be repeated. I think that this is understood, but somehow its assumed that new technologies will emerge soon and that therefore solar doesn’t need any more help right now. Or that the low margin solar industry can somehow deliver further large cost reductions. By turning the support off at the state level and failing to take a principled stand to enact rooftop solar policy that creates measurable economy wide carbon savings, Australian politicians are now in fairy land when they now talk up how great our rooftop solar industry is. Yet it need not be this way. Firstly as the cost of solar has dropped, policy leverage has increased. The cost of an unsubsidised, fully installed solar system has dropped nearly three fold in the last six years, largely due to a much larger decline in the cost of the PV panels themselves over 2009 to 2013, which now represent only around half the total cost. Based on past experience we could assume that large numbers of households, would still invest $5,000 to $6,000 on average on a solar system, provided a reasonable payback of up to roughly seven years is achieved. With policy stability to provide certainty of savings, such paybacks can also enable bank financing of solar systems, such that even low income households can install solar. As a result $1 in state government policy support for rooftop solar gets much more leverage than it did back in 2010. Its difficult to find any other area of clean energy investment where government incentives can have so much financial leverage. But this leverage only happens at scale if the policy support is sufficient to get the payback down to a level acceptable by rooftop owners, which is roughly 7 years. With too little an incentive, as is the case now, the big numbers that are needed to wean us off fossil fuels aren’t being hit. Its often hard for clean energy companies to attract financing. The energy efficiency sector, which can often offer better paybacks that solar without any subsidy, has struggled for decades to attract serious financing. Rooftop solar – because solar is reliable, visible – had attracted extraordinary amounts of private investments, mostly from “mums and dads”, – financing that other clean energy sectors envy. Its an extraordinarily effective way of getting large private investment – provided the payback is reasonable. Secondly, smart meters make it possible to much better understand and manage the causes of network constraints. And clever deployment of batteries at the network level, or home batteries controlled by the network, can economically manage these constraints. Policy focused on using storage to address network constraints caused by solar and to eventually enable greater renewable penetration is enabled by smart meters – meters installed with each solar system, if not already in place. It appears as though we are now entering a time of falling network tariff’s, as regulators crack down after the “gold plating” of the distribution network. Its a good opportunity to use FITs or similar policy mechanisms funded by small tariff increases – and resulting in no overall tariff increase because of the decline in network tariffs – to re-incentivize solar. And, as argued in my previous post, the electricity marketplace rules should be completely revised to foster the switch to green energy, rather than just grudgingly allowing renewables into the market. But with this seemingly not being contemplated, at current trends it will be RIP rooftop solar. 2009-2016. Not withstanding all the rhetoric about how great our solar rooftop industry is. Look for the next posting: Suggestions to rooftop solar companies in a tough marketplace.